Boss Keith Curle has spoken of the ‘accountability’ he has instilled at the Cobblers, and revealed it even stretches to how well the players park their cars ahead of training every day. The Town manager admitted that, aside from turning things round on the playing side, the hardest task he has faced since taking the reins at the PTS Academy Stadium has been ‘changing the attitude within the changing room’. Curle took the helm at the beginning of October, replacing the sacked Dean Austin, and he has spent the past five months trying to stamp his authority and instil his personality on a squad that had been managed by four different managers in just two years. There have been sticky moments along the way, but it seems as though Curle’s message is really starting to hit home, with the Cobblers on an eight-match unbeaten run, and steeling themselves for the unlikeliest of charges for a place in the promotion play-offs. With eight games of the season remaining, Town have risen to 11th in the Sky Bet League Two table, and to within six points of the top seven, and there seems to be a real momentum building at the club again. So how has former Mansfield Town, Notts County and Carlisle Unted boss Curle turned things round? Well, he insists a key part of getting the team performing on the pitch is getting the small details right off it - and that includes parking their cars! 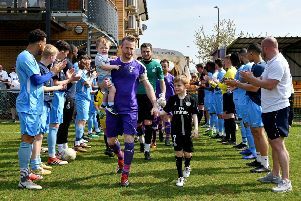 “Probably the biggest shift since I have come here, is changing the attitude within the changing room,” said Curle, who brought in his own team to support him when he got the job, in the shape of assistant Colin West and goalkeeping coach Dan Watson. “The players are enjoying the changing room, enjoying their environment, but are being held accountable for their environment, which I think is massive. “It is all about accountability, and making sure the players are aware that what they produce on a daily basis, and their persona and personality in and around the building is what I judge them on, not only their football ability. “I have enjoyed coming into work, and I am enjoying coming into work because I know the atmosphere is good and people are taking on board the challenges we are setting them. “We have guidelines, we have designated parking spaces between parallel lines, and they have to show that as soon as they get out of their car they are aware that everything they do is monitored. “When we first came here there were people parking in disabled bays, people parking outside of the white lines and taking up two bays, and it used to annoy me, even though it is a little thing. “So when they turn up to work they are monitored for the little things that they do, and it is the little things that can have a big impact. And it is not just the players who are accounable either, with Curle insisting all members of staff in the club’s football department perform at the top of their game as well. “The tone all comes from the manager, and then there is a domino effect,” said Curle. “You start from very much in line with the intricacies that are put in place, and people have a good understanding of what my mindset is about, and I like things to be right. “I want people to be in the right place, be on time, and be accountable, and those things filter through into the environment. “Members of staff are in charge of their environment, with the expectations that I put on them and how I expect that department to run. “I don’t run every department, but I am accountable for every department, and because of that my staff are accountable for what they produce. “Whether that is in strength and conditioning, medical, the kit department, I don’t want to run everey department but I am accountable for all of them, and I give those people the responsibility. “That is exactly what I do with the players. “They are accountable and are given responsibility, but they also get an outline of what my expectations are and what they need to produce.